Asahi Shimbun, a national newspaper in Japan, has become one of the first traditional media companies to set up a crowdfunding platform with the launch of “A-port”, a site dedicated to funding art projects and movie productions. By promoting its campaigns via a major news outlet, A-port has an advantage over other crowdfunding sites in terms of visibility. Simply put, artworks and related proposals will attract more visits, views and listens on A-port than its rivals. Like other traditional media companies, Asahi Shimbun is constantly vigilant of the challenges created by the rapid development of the Internet and information technology. In order to stay ahead in the market, the newspaper publisher have changed its business model many times over the years. This crowdfunding operation began in 2013, when Asahi Shimbun held an internal contest to find creative startup projects. The winning team of the startup competition was transferred to Asahi Media Lab, where they worked on the launch of the crowdfunding site. A-port was officially online and ready to receive campaign applications on March 25, 2015. The “A” in A-port stands for a sense of “Adventure” as well as a desire “Action”, both of which are shared by the crowdfunding project initiators and the people who supported their ideas. 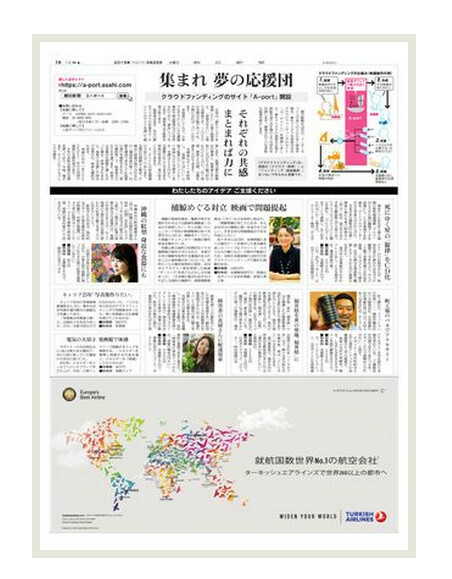 Asahi Shimbun has in-house expertise in editing and packaging. Plus, it has a wide reach of readership and a powerful media network. Thus, the newspaper publisher is in a unique, favorable position compared with rival crowdfunding platforms such as CAMPFIRE and READYFOR.